We have selected for you 100 great quotes about love. 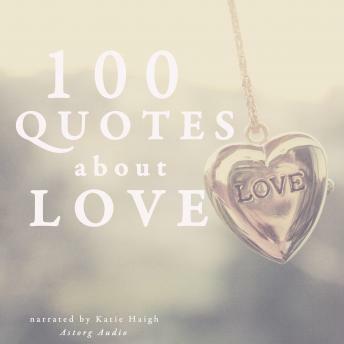 The range of authors of those 100 quotes about love is very wide: from Marilyn Monroe to William Shakespeare, from Lao Tzu, of course, to Jane Austen, Mahatma Gandhi, Charlotte Brontë, Oscar Wilde, from Mother Teresa to Victor Hugo or Charles Dickens. A great quote is very similar to a great thinking and a small poem. It can encapsulate a large web of ideas, thoughts, reflections, emotions in a few words. The reader of a great quote is forced to think about what he just heard. He has to think about those words and what they mean. An excellent quote requires the reader to pause to contemplate the real meaning and poesy of a few words. A great thought reaches a level of universality. Quotes hit hard into the essence of being human. The right quote can help us see some invisible meanings of things or subjects.